Choosing to study in Australia will provide you with wonderful opportunities and experiences, as well as world-class education. Here are four reasons why you should consider Australia as your study abroad destination. Courses offered by institutions in Australia, from preparatory level to postgraduate programs, are flexible and equipped with global perspective. In 2014, areas such as engineering, accounting and health sciences ranked highly in the QS World University Rankings by Subject. Australian universities also receive good ratings for teaching quality, research and graduate employment. Visit our Course search and Institution search to find the course and institution that's right for you. Australians are kind and friendly, with an immense passion for sport, food and entertainment. Just like on campus, you will meet people from different cultures and faiths across Australia. If you wish to experience bustling city life, big cities like Melbourne and Sydney are great examples of a fantastic contemporary lifestyle, from modern art museums and cafés to beautiful city parks. Enjoy food festivals such as Perth's Margaret River Gourmet Escape and the Melbourne Food and Wine Festival, and visit one of the 60 designated wine regions across the country. You can also experience Indigenous culture across Australia. See Australia's regions to find out more about states and territories in Australia. 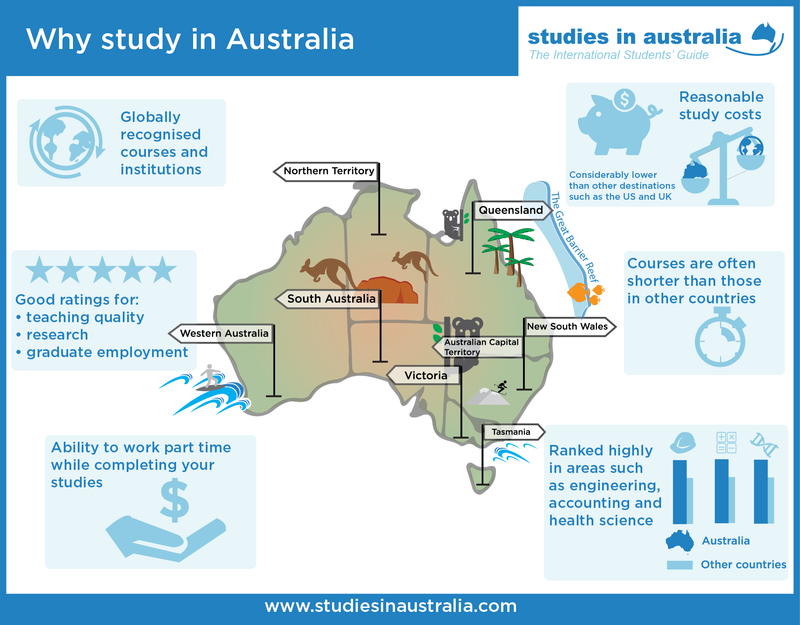 Study costs in Australia are considerably lower than other major destinations such as the United States and United Kingdom. Fees for secondary schools in Australia start from $AUD7800 and can reach around $AUD30,000 per year. An undergraduate program can cost you from $AUD15,000 to $AUD33,000 per year and postgraduate tuition fees range from $AUD20,000 to $AUD37,000 annually. Vocational Education and Training (VET) and Technical and Further Education (TAFE) courses start at around $AUD4000 while fees for foundation studies start from $AUD15,000 per year. Planning to take up an English language course? These courses start from only $AUD300 per week depending on the course length. Australia has diverse landscapes, beautiful coastlines, vast outback and modern cities, as well as unique marsupials such as kangaroos, koalas, wombats and quokkas. Studying in Australia is a ticket for you to visit natural attractions, including the Blue Mountains in New South Wales, Uluru-Kata Tjuta National Park in the Northern Territory, the Great Barrier Reef in Queensland and Rottnest Island in Western Australia. A great benefit of studying in Australia is being able to experience the sunny weather and laid-back attitude for which Australia is well known. If you are getting ready to begin your study abroad journey in Australia, Studies in Australia is the best place to start. Explore our site for further information, such as the support services available, accommodation options and international student testimonials.